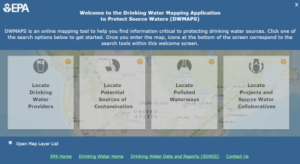 Welcome page of DWMAPS displays search tools for users to find information about drinking water sources. This robust, online mapping tool provides the public, water system operators, state programs, and federal agencies with critical information to help them safeguard the sources of America’s drinking water. The DWMAPS – the Drinking Water Mapping Application to Protect Source Waters – allows users to learn about their watershed and understand more about their water supplier. The DWMAPS also allows users to see if sources of their drinking water are polluted and if there are possible sources of pollution that could affect their community’s water supply. The tool can even guide users to ways they can get involved in protecting drinking water sources in their community. For more information and to access the map visit http://www.epa.gov/sourcewaterprotection/dwmaps.